This book was AMAZEBALLS! Here are some of my reading update posts previously posted at BookLikes. This book has been lurking on my feeds via many reviewers and friends I follow in the reading community lately. 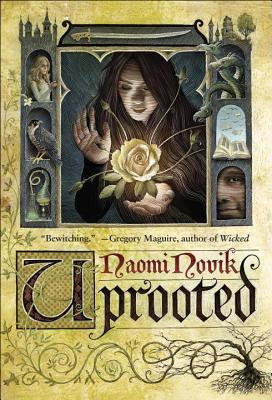 The general consensus seems to be very much positive with exclamations of surprising "Wow"s.
And so I felt compelled to jump on the Uprooted bandwagon (I requested a hold on the book from the library and got it pretty quickly), even though I've never read a book by Naomi Novik before, though I've heard good things about her fantasy novels. Maybe I'll even end up jumping on the rest of her books after this because I truly am excited and interested in read the rest of this book. For one, fairy tale retellings are some of my favorite types of books, even if Beauty and the Beast isn't my favorite fairy tale. I've read a select few Beauty and the Beast retellings which I have loved, so I'm hoping that this one delivers just the same. Secondly, just from the first chapter alone I'm already enchanted by the writing and that somewhat magical feel to the story telling. And Agniezka... I'm slightly taken aback by her rumpled and incompetent nature at this point, but it all comes across so realistic that she's not that "special" girl who was supposed to be the "chosen one" offered to the Dragon that I'm intrigued to see how her development will come about. Although I am already loving that she's giving Dragon a surprising startle each time they encounter each other, which, in some way, already makes her that "one special girl" who is definitely destined to be the main female character of this story after all. Reading progress update: I've read 93 out of 435 pages. "You shouldn't have said miko there." I shrugged helplessly: I didn't doubt that I had, though to be perfectly honest I didn't remember. But it hadn't been an important thing to remember. "It was all right when I did it," I said, "but when you did it, it was wrong. As though--you were following a trail, but a tree had fallen down in the meantime, or some hedge grew up, and you insisted on continuing on anyway, instead of going around it--"
"There are no hedges!" he roared. "It comes, I suppose," I said thoughtfully, speaking to the air, "of spending too much time alone indoors, and forgetting that living things don't always stay where you put them." He ordered me from the room in stiff fury. I love the shift of power in their relationship-non-relationship and how it's starting to develop. Before, Dragon was this intimidating, all-powerful wizard who Agniezka tried so hard to avoid and tried so hard not to upset or anger. But now that it seems like Agniezka might have some sort of power after all, even if her magic isn't as straight forward or as logical as Dragon would like it to be, she seems to have noticed that they're becoming closer to equals than he probably would like. She's less intimidated by him and it seems like she even finds his need for straight-forward logic kind of amusing. Agniezka is no longer being the quiet, scared and mousy girl who couldn't figure out why she was the one taken in the first place. I love how her backbone just snapped right into place once she realized that she could perform magic and might have an affinity towards healing. I just love how everything she does makes him tick, even when she's not doing anything wrong. I love this new dynamic! And I love how her descriptions of how she performs her magic kind of wanders in a strange, flighty imagery of living nature. It's interesting. These updates were originally posted at Ani's Book Abyss / BookLikes in July 2015.